The 2nd season covers the remaining 83 chapters of the manga (the Egypt arc). Definitely some spoilers, don't read if you don't want to be spoiled. The story became very repetitive at this point. Most of the episodes were: Go from current point to next point, encounter enemy Stand user, defeat stand user, repeat until we reach Dio. It became a monster-of-the-week series and it just felt really bland. The fights varied somewhat but in the end I was expecting a little more than what was essentially an RPG grind until you hit max level and go do an end game boss. The art style definitely made everything feel more dramatic and dark, while the backgrounds gave a really good view of what Egypt looks like (at least from someone who hasn't been there). The characters themselves are very detailed with proper shadings of clothing which makes them look 'realistic'. The op of the first season was really good and it got you pumped up and it made you feel manlier just by listening to it. But this second season's op just reminded me of Rozen Maiden, it doesn't fit. The voice acting is the same as the first season so if you liked it there, you'll like it here, especially hearing Jonathan yell "AWEEE MAIII GAWDDDDD" or "SHIIIIITTTT". The villains felt very cliched in that they're always over the top sadistic with no redeeming qualities. Each one was basically just 'bad guy with certain bad trait' repeated over and over every episode until we got to Dio. Dio - Dio maintains his arrogance and threatening nature which definitely made him feel like an end raid boss and reinforces his antagonistic role. Joutarou - If you can call standing around, posing 'cool' and saying "Yare Yare Daze" as being a character... well... he's a character for you then. Initially, this was kind of cool, the nonchalant, tough without overtness attitude, but after two seasons of this composure, it starts to become dull and repetitive. Any encounters that involve Joutarou is basically resolved before it even begins and all you're left doing is thinking how far his legs are going to be apart this time and how angled is his body going to face. Jonathan - Not as cool as when he was younger with all his predictions but still a staple character that is hilarious when he swears/yells in Engrish. Polnareff - Basically the comic relief of the show but his character really shines during his emotional moments with his comrades, especially Iggy. Iggy - I initially didn't like him as his existence felt out of place most of the time as he didn't do very much, but in later episodes his character really develops and I liked him near the end. Avdol - A firm, stable character that really cares for his friends and even sacrifices himself. Things actually happen to him which makes him feel mortal and human. Kakyouin - Really stayed the same from the first season though his bonds with his comrades grows stronger. Definitely wasn't as enjoyable as the first season as the encounters with the other Stand users felt very repetitive and monster-of-the-week. At this point, it just became repetitive until we came to the final showdown between Dio and JoJo. An action-packed adventure of fun, bizarreness, crazy gimmicks, and dangerous distinction. Jojo’s Bizarre Adventure Stardust Crusaders: Second Season (or Egypt Arc) provokes the question of what the audience wants to see next. The first half of the adaptation already showed plenty of Stands ranging from one that can attack via reflective surfaces, a parasitic being that can enter a victim’s brain, or even a Stand that can attack in dreams with Freddy Krueger style. The answer is simple really. It continuously deliver a source of imaginative and entertainment that almost anyone will find entrancing. As a direct continuation of the first season, it’s imperative to watch it before venturing into the Egypt Arc. Otherwise, you’ll be wondering around like a goat in a desert. Propelled by the series’ vision to craft a dynamic adventure, we are introduced to new allies and enemies. 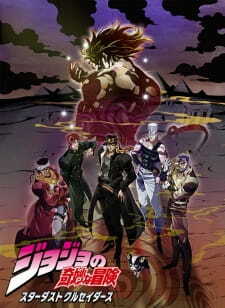 Of course, the main cast returns as well including Jotaro, Joseph, Avdol, Kakyoin, and Polnareff. Joining them is a new ally in the form a dog named Iggy. Bringing in non-human characters into a series always presents a challenge but Iggy isn’t just an ordinary house common animal. He has a Stand and there’s even an episode that really brings out his abilities for the audience to see. Because the first season has exhausted Dio’s resources and servants, we are introduced to new and more dangerous enemies for the crusaders. Adapting well with its Egyptian theme, these new enemies presents a challenge like never before. We have Big Bads that do all sort of otherworldly things that people can’t even begin to imagine. It really brings a focus to Jotaro and his friends as they struggle to survive. A good measure of the fights not just test them on a physical level either but mentally as well. The D’arby siblings are a good example of this as they rely on trickery and deception to get what they want by pitting their enemies in twisted mind games. Then, there’s also the creativity coming from the brainchild of the series, Hirohiko Araki. The characters he makes not just possess a diverse range of personalities but also has Stands that bring out their sheer tenderness. As daring as some of his ideas are, they work well when it comes to bringing a mixture of thrilling excitement, mystery, and humor. Indeed, the comedy for the series is like no other. From the artistic style of Boingo’s Tohth to Sethan’s power of age manipulation, there’s almost something in it for everyone to witness. Furthermore, the gimmicks of the show return in full with our main characters’ personalities. They may all have different personalities but their goal in hand is the same – to save Holly from death. As such, expect the mood of the story to get more and tenser as the journey takes them closer and closer into Dio’s palace. However, there will still be times when the story feels like a ‘monster of the week’ style. Certain characters also makes reappearances that gives them another chance to shine. For what’ worth, this second season behaves in a similar way with the first half in conjunction with their journey. Then, the latter half really picks up the pace as we get to the grand stage. Patience is a key to understand and enjoy the show as David Productions is willing to adapt the most important element of the story. To capture that style of Jojo is never easy but adapting with a steady pacing with weekly doses of adventure is something to take granted for. As such, I recommend watching this show in a weekly style rather than a whole marathon. It will leave you wanting for more as each episode brings something new to the table. And when the battle against Dio draws to its climax, you’ll realize that the patience was well worth waiting for. The artwork of the second season along with its soundtrack remains generally the same but still retains the sense of exhilarating fun. Taking place in Egypt, we get more of the classic Egyptian-like atmosphere with more desert themes involved. As such, expect the soundtrack to reflect a bit of that culture. Opening theme songs are also clear with its choice by orchestrating the classic Jojo style that we should all be familiar with by this point. Surprisingly though, the ED theme songs has a more vibrant and melancholic tune. While seemingly off balance in some sense, I find it to be captivating as it creates a sense of serenity. Finally, there’s also the character voices that each reflect dynamically at how the characters behave. The villains’ textural motives also has a good amount of credible voice mannerisms to make the audience feel what their roles are. Then, there’s the artwork that continuously dedicates itself to capture what this journey been – crude, dangerous, and insane. However, that’s all in a good way. (minus some editing of the censors) David Productions’ visual standards impresses with their work by delivering stellar landscapes, well-made architectures, and a wealth of character designs to make the audiences awe. Similarly, expect the action to blow you out of the seats with its extensive prowess. In a nutshell, the second season is what you will expect and get. And that would be thrilling action packed adventure of non-stop pandemonium. It’s a show that unites all sorts of strange gimmicks to deliver what the audience wants. Assuming that you like stunts, unpredictable characters, mind games, or dynamic comedy, then this season will be quite a looker. Now, this might not be a show for anyone though. There are at times problems when people feel like pacing becomes sour and certain parts from the original source omitted. Or there may be certain characters that get lesser screen time than others. However, the adventure never stop at its mark and packs its bag. Instead, it shows why the series is called Jojo’s Bizarre Adventure. And that is freaking awesome. When you're in the world of anime and manga, there are these popular and trending materials that are too long and big to take up and follow. No matter how hard you try to ignore these trends, they keep popping up, and it almost feels like it is impossible to stay up to date in the anime world without watching/reading them. At least for me, not staying up to date is like being dead in this world of anime. JoJo was one of these trending things, and I tried real hard to ignore it, because getting myself in the JoJo world would only fatten up my backlog. However, then back in 2012, I heard JoJo manga (which is quite old) is getting animated, and thought this was a good chance for me to get myself into the series. May be I was crazy or something, but I thought at that time, it would be better for me to finish the manga before I watch the anime. This doesn't mean you have to do the same thing and read the entire manga before watching the show! I mean, I loved the manga, but it's really your choice, because the anime has done an excellent job faithfully adapting the source material. The entire JoJo show is 26+48 episodes. I know it is a daunting task to watch all that, but the show is a fun-ride that is fast and satisfying. The second season of JoJo's Bizarre Adventure: Stardust Crusaders is the when all the real stuff of the 3rd part of JoJo manga happens. It picks up right where the first season left off and doesn't waste a moment to start doing what Stardust Crusaders does best, and that is episodic, intense, imaginative fights. Not much is changed in the overall sturcture of the show. It still follows the formula of traveling from one place to another, and encountering new enemies on the way in an episodic manner. The cream of the entire show are fights, and I am happy to say that the second season is where most of the better fights from the manga take place. The fights in the second season are longer and way more intense and imaginative. The fact that unlike the first season, the second one has a define ending, really helps the show too. I honestly think that both season should be judge as one anime show, because they are just a single story, divided in two parts, because it would take too many episdoes to adapt it all in one season. The show is still over the top as all and rather silly or dumb at places. Thankfuly it knows when not to take itself seriously and thus the sillyness never really hinders the experience too much. This season has a healty dose of fun episodes and moments, is also has a healthy amount of rather touching and sad parts. Some characters get a bit more development, some don't. We also get a new character in the face of Iggy the dog, who is heck lot of fun to watch and really adds to the chemistry of the entire group. The art style is still awesome looking. The soundtrack is more of the same for the most part, not that there is anything wrong with that. The soundtrack for the first season was really good by itself. Even if the animation itself is pretty static, the design,style and directing make the anime look wonderful. Overall it is a darn great finale for the adaptation of the third part of the JoJo's Bizarre Adventrue manga. It left me completely satisfied and I really hope they will keep adapting the manga into more seasons of anime. After all the next part: Part 4 Diamond is Unbreakable is really great.